There is one interesting thing I found that Japanese people are interested in colored maple leaves very much. 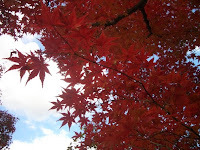 Kyoto is very popular for Maple leaves and very crowded with tourists in this season. You might be surprised at that Japanese people go to Canada just for Maple Leaves in autumn. What I was curious is that this is only Japanese. Canadian or American or French what ever... are not really interested in it. 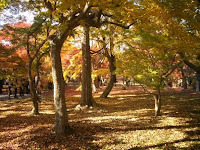 There is a word "Momiji gari" in Japanese which means "Maple Hunting". But we don't really do hunting, maybe just pick up fallen leaves. Maple Hunting means watching leaves and enjoying the beautiful view. I went to Tofukuji Temple for "Maple Hunting". There were many people even on weekday. 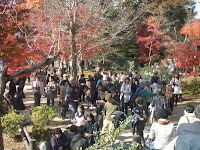 Tofukuji is the most popular place for Maple leaves and I heard that 1,000 people came here last week end. 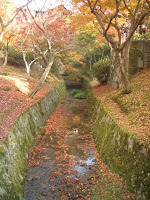 Do you think it is worth visiting Kyoto for "Momiji Gari" during autumn season? They are OTOWA junior high school studednts. they are only 13years old and come here for job experience from their school. they want to know how to work in ryokan and when this experience finish they have to write big report for their class. They introduce theirself here . They work hard but they can help us only 5days. when you saw them please try to talk to them! I found a nice cafe lately. It doesn't look like a cafe. It would rather look like ryokan or a big Japanese restaurant or something... The name is Ex cafe. 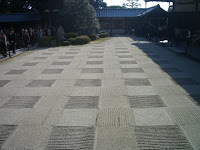 It is located in Arashiyama. You might hesitat to approach it at first because it dosen't look like a cafe. I did actually... 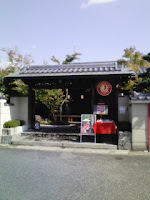 But there is a menu infromt of the gate, so you will be able to realize this is a cafe. 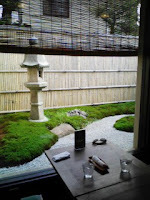 You can see kind of Zen garden from the seat. It is very quiet and there are wooden tables and chairs. The atmospher was nice. Of course food was delicious! 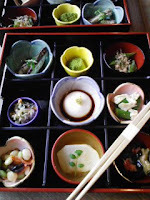 I took a luch plate which consists of different small plates. Rice and miso soup come with this plate. After 14:00, you can have cafe menu like sweets or burger.